I look forward to my Grandma and Grandpa's Christmas party every year. I have only missed one my whole life, and I love them. 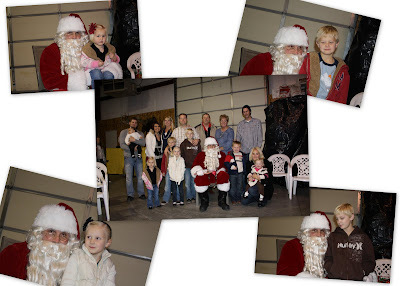 There is always the same foods, the same drinks and usually the same activity (family talent show), and a visit from Santa. This year my grandma decided to change things up a bit. A few weeks before Christmas she heard some disturbing news about some people in her Stake. The same Stake that Matt and I both grew up in. There was a little family that was contacted by a Relief Society President. She found out that this sweet mother to two young children had not eaten for four days. She was saving the only food that she had, which was a few eggs, for her four year old child. She also has a nursing baby. This story struck all of us straight to the heart. This was happening to people right where we live. 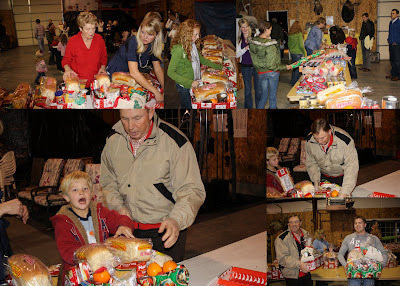 That night after dinner, we put together some food boxes for some people that desperatly needed it. It was amazing to see the desire that my kids had to serve others. The faces of people that are in need has certainly changed over this past year. What a blessing to be able to give to those who are truly in need. A couple of my cousins took this one step further and started their own food drive. By the end of the week they had a truck bed full of canned food to help those in need. What a great way to start the Christmas season! I started crying when I first heard about that family when I was reading Tara's blog. I think it is a great new tradition we should keep going, and next year I can actually be there! What a wonderful thing to do! I wish I would have known so that I could have donated to you! It was great seeing you over the holiday!